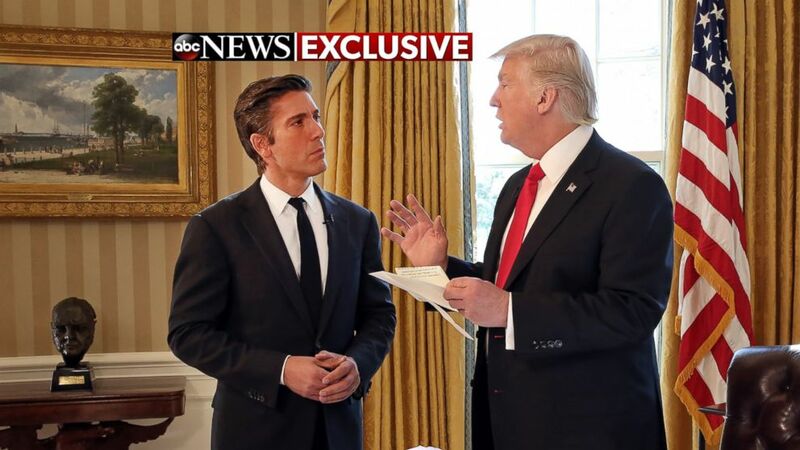 On Wednesday, Jan. 25, 2017, ABC News “World News Tonight” anchor David Muir interviewed President Donald Trump in his first sit-down television interview in the White House. DAVID MUIR: Mr. President, I know you’re only five days in. Has it changed you? PRESIDENT DONALD TRUMP: I don’t wanna change too much. I’ve had a wonderful life and wonderful success. I wanna make this a great success for the American people and for the people that put me in this position. So I don’t wanna change too much. I can be the most presidential person ever, other than possibly the great Abe Lincoln, all right? But I can be the most presidential person. But I may not be able to do the job nearly as well if I do that. So I can say that it probably will change me somewhat. I’ve only been here a short period of time. But right now, I’m negotiating for jobs coming back into our country. I’m negotiating the cost of airplanes that are outta control, fighter jets and various other things. And I’m doing a lot of work to save a lot of money and to bring back a lot of jobs. PRESIDENT DONALD TRUMP: We have so many different locations and so many different places. And it’s really the history. I’ve seen beautiful houses over the years. This is a truly beautiful house. This is beyond what I thought. But it’s not so much the beauty, it’s what it represents. The White House represents something so special. And that’s what I think impresses me much more. DAVID MUIR: Your predecessor used to talk often about finishing the day to get to his family upstairs — the stairwell’s right over here — to have dinner with them. And I know that the First Lady, Melania, has a big job back in New York taking care of Barron. PRESIDENT DONALD TRUMP: No, because I end up working longer. And that’s okay. I mean I’m working long hours. I mean the country has a lot of problems. It has a lot of problems. And yes, Barron’s getting out of school in another three months. And to take him out now is very unfair. He’s very young. Very — very, very young. And people think because he’s so tall that he’s 16 years old. But he’s 10. He just turned 10. But he’s a great boy. But we wanted him to finish up school where he is. DAVID MUIR: And then he’ll come to the White House? PRESIDENT DONALD TRUMP: It’s a big house. But there’s always plenty to do. And they do a fantastic job. It’s so well run. And in fact, Angela, come here. Come here, come here. I’m gonna put you on camera. DAVID MUIR: You didn’t know this was gonna happen, huh? PRESIDENT DONALD TRUMP:–I wanna thank you. DAVID MUIR: Every president says that, that it’s the staff here that becomes the second family. PRESIDENT DONALD TRUMP: Great staff. Because they love the place, also. It’s special. I see the staff at every level. And they love the White House. It’s a special place. PRESIDENT DONALD TRUMP: Let’s go. PRESIDENT DONALD TRUMP: When they explain what it represents and the kind of destruction that you’re talking about, it is a very sobering moment, yes. It’s very, very– very scary, in a sense. PRESIDENT DONALD TRUMP: –very scary thing. DAVID MUIR: Every president does get asked, though, what keeps them awake, what’s unsettling. What has been most unsettling for you now that you’re five days in? PRESIDENT DONALD TRUMP: Well, I think I see a tremendous amount of waste. I see a tremendous amount of job opportunities that have been let go for many years. And I’m not just talking about President Obama. I’m talking about for many, many years. And I was a big, big fan of Ronald Reagan. But I was never a fan on trade, as you may have noticed, if you look back at clips. I was never a big fan on trade with respect to Ronald Reagan. PRESIDENT DONALD TRUMP: I just think we’ve had years and years of allowing our jobs to be dissipated in this country. And there’s no reason for it. PRESIDENT DONALD TRUMP: All very important. Yep. Terrorism is, to me, number one, because we have to keep people safe. Most importantly, we have to keep people safe. But the economy is certainly– I mean we have to bring the jobs back — I talked, the forgotten men and women. They’re not forgotten anymore because they came out and voted. A lot of people, you folks, didn’t know they existed in a true sense. Everyone’s saying, “Where did they all come from?” Was pretty amazing, wasn’t it? DAVID MUIR: Let me just ask you, while we’re standing outside, could you hear the voices from the women’s march here in Washington and around the country? We– we know there were more than a million people who turned out. And you are their president now, too. PRESIDENT DONALD TRUMP: That’s true. PRESIDENT DONALD TRUMP: No. I couldn’t hear them. But– the crowds were large. But you’re gonna have a large crowd on Friday, too, which is mostly pro-life people. You’re gonna have a lot of people coming on Friday. And I will say this, and I didn’t realize this, but I was told, you will have a very large crowd of people, I don’t know, as large or larger. Some people say it’s gonna be larger. Pro-life people. And they say the press doesn’t cover them. DAVID MUIR: I don’t wanna compare crowd sizes again. PRESIDENT DONALD TRUMP: No. You shouldn’t. PRESIDENT DONALD TRUMP: We’ll see. DAVID MUIR: I guess what I’m asking is, we saw the marches around the country. And you are their president now. DAVID MUIR: Do you sense the responsibility to reach out now and to unite them? And, and for– for those women, men, children who marched, who are watching this, what would you say to them? PRESIDENT DONALD TRUMP: Well, I do. But I have to also say, we just had an election a few weeks ago. And they voted, in many cases. In some cases, they didn’t vote, I imagine. And we did have an election. With that being said, absolutely I have responsibility to everybody, including people that didn’t vote for Donald Trump. Totally. Okay? DAVID MUIR: So we’re in the Oval Office. PRESIDENT DONALD TRUMP:–we put some of these up. DAVID MUIR: We’re standing on Ronald Reagan’s rug? PRESIDENT DONALD TRUMP:–the desk, yes, that’s the Resolute Desk, very– very famous. You know it’s got more paper on it now than it usually does. PRESIDENT DONALD TRUMP: And– and this is actually very nice. This is actually– couple a things that are interesting. This was given to me by one of the combatants that I fought to get here. And Adams versus Jefferson. And this book, they say this was the most vicious campaign ever fought for president until this. PRESIDENT DONALD TRUMP: And this was the– the letter given to me by President Obama. PRESIDENT DONALD TRUMP: Which was– I won’t– show it to you, read it to you. But just a, a beautiful letter. DAVID MUIR:–can share that– that struck you most? PRESIDENT DONALD TRUMP: There were numerous lines. So well written, so thoughtful, so thoughtful. And in the drawer, you know, put in the drawer, which is a custom. But I doubt too many of them were written in this manner. He real– I– in fact, I called him and thanked him for the thought that was put into that letter. DAVID MUIR: That one looks a lot longer than the ones that I’ve seen. PRESIDENT DONALD TRUMP: It was long. It was complex. It was thoughtful. And it took time to do it. And I appreciated it. And I called him and thanked him. You know, usually it’s, “Hey, good luck. Lots of luck. Have fun. Enjoy yourself.” Right? I’ve seen ’em. I mean it’s like I– I saw another one recently where it was sort of that. No, this was a very well thought out letter. DAVID MUIR: –since the inauguration? PRESIDENT DONALD TRUMP: Well, it doesn’t matter. But I– I really wanted to thank him for that. Because it was– much more special than you would have thought. PRESIDENT DONALD TRUMP: Well, I think nothing that surprised me. But it was stated beautifully. But that I’m representing a lot of people. And– I’m carrying on a very important tradition. And just do a great job. He wants me to do a great job. He said something that was very interesting to me. He said, “You know, if I thought your health care plan was going to be better than– ” his plan, Obamacare, “I would support it.” And I believe he would. I believe he would. But it was a very interesting statement. He said, “You have to understand. If I thought your plan was better, I’d actually support it.” So we’ll see how it all boils down. But– we’ve actually– you know, we– we developed– people are surprised, ’cause it’s a very vicious campaign. PRESIDENT DONALD TRUMP: –to me, and he may say differently– is that we, I think, have sort of a great relationship. And yet, it was a vicious campaign and vicious things were said by him and by me about each other. I mean he said that, you know, I would never win the Republican primary– primaries, because he was, you know talking about I will never represent the Republican Party. Then I won. That I will never win. And– and I said vicious things about him. It was a very, you know, you talk about Jefferson and Adams. This was rough. And Hillary had a great asset on her side, him and Michelle, who is a phenomenal person. But Hillary had these two people that were really campaigning big league. In fact, I was going out and campaign– you know, really complaining about it. I was saying, “Not really fair.” But– to have that kind of vitriol, to have that kind of stuff going on, and then we’re riding in a car together up Pennsylvania Avenue. And I’m saying to myself– I actually said to him, “This is a little weird, isn’t it, huh?” But we really– we didn’t discuss the negative. We only discussed the future and the positive. And we really get along well. Now again, he may say differently. But I don’t think he would. We really got along well. PRESIDENT DONALD TRUMP: I just don’t know. I mean I– I hope so. And from my standpoint, we wanna move onto the future. So I hope so. I don’t know what the status of that is. I know it’s a lot of very serious stuff. But I certainly hope so. PRESIDENT DONALD TRUMP: Right. I’m very proud of that. Very proud of that. The business community, and the labor community, you saw that with the labor leaders that came out. One of ’em said, “It was the single greatest meeting I’ve ever had with anybody. It’s the highlight of my life.” And the Dow, on top of it, just hit 20,000– first time in history. I’m very proud of that. Now, we have to go up, up, up. We don’t want it to stay there. DAVID MUIR: That’s the challenge, Mr. President. PRESIDENT DONALD TRUMP: That’s gonna be the challenge. But it’s gone up a lot since I won. Don’t forget, when I won, people thought, “Oh, maybe it will go down.” But the business world doesn’t think that. The business world knows me. They don’t think that. And it was a steady climb. And now we just hit a record and a number that’s never been hit before. So I was very honored by that. DAVID MUIR: I’m honored to be here in the White House. PRESIDENT DONALD TRUMP: Well, again, I didn’t have a lot of free time, which probably is a good thing. But I’ve been comfortable right from the beginning, very much so. It’s– feels like home. PRESIDENT DONALD TRUMP: Well, I am. These are some of the pictures that were taken. This is the swearing in. And the first dance with Melania. This is coming down the stairs. I mean this is as an example I– I hope you can get this. Because you always bring it up. But there’s a picture– here’s a picture of the event. Here’s a picture of the crowd. Now the audience was the biggest ever. But this crowd was massive. Look how far back it goes. This crowd was massive. And I would actually take that camera and take your time, if you wanna know the truth. But we’re very proud. When I went out there and I saw that num– that sea of people, I couldn’t believe it. And then, to be criticized was incredible. But the bottom line is we had the better audience in the history of inaugurations. And I think you have agreed with that. Is that a correct statement? DAVID MUIR: I don’t think it’s provable. I know what you’re pointing to is around the world, right? PRESIDENT DONALD TRUMP: Trust me, it’s provable. DAVID MUIR: –on inauguration day. I saw you put your hand on President Obama’s back there. PRESIDENT DONALD TRUMP: There is a warmth. Look, if you see that picture, there is a warmth there. But that was an incredibly beautiful moment. And I’ve seen it over the years. I’ve seen the good and the bad. ‘Cause I saw Nixon fly out. Whole different thing. And I actually said to him, “This feels a lot different than what Nixon had to go through, that I can tell you.” That was a beautiful moment, I think for them. In fact, he took pictures of lifting off. And they were beautiful pictures of us all standing there. But the scene of that great machine turning on and lifting off, it was really something special. PRESIDENT DONALD TRUMP: Well, I told you over there. I told you. What I said to him, or what I– I left a message for him– I thanked him for the letter. DAVID MUIR: Is there any chance Ivanka might have a– an office right here in the White House? DAVID MUIR: We know he’ll have a role. He has an office. DAVID MUIR: So you’re not ruling it out. PRESIDENT DONALD TRUMP: She’s got every quality you can possibly have. I don’t rule out anything, no. There’s certainly a possibility. And Jared has been here and he’s doing a great job. DAVID MUIR: Who captured this? This is just somebody– This is amazing. PRESIDENT DONALD TRUMP: He’s a professional ph– didn’t work for us. He wrote– he wrote us a note and he sent us that picture. And we thought it was beautiful, we put it up. But– one thing this shows is how far over they go here. Look. Look how far this is. This goes all the way down here, all the way down. Nobody sees that. You don’t see that in the pictures. But this was a massive crowd, and a (UNINTEL) crowd. And the audience was so great. And– you know, the– the beauty was the response to the speech. And it was really a speech, David, of optimism. This wasn’t some of– the– the one thing that some people said was it was dark. It wasn’t dark. PRESIDENT DONALD TRUMP: Well, that’s– look at Chicago. I mean am I supposed to say that’s wonderful? It’s wonderful what’s going on? That’s carnage. Thousands of people are being shot and many people are being killed. And other inner cities, also. So when I say, “carnage,” that is carnage. It’s a very accurate word. Few people covered it that way. He said, “You know, he used the word ‘carnage. '” That’s a totally– accurate word. But when you look at this tremendous sea of love– I call it a sea of love– it’s really something special that all these people traveled here from all parts of the country, maybe the world, but all parts of the country. Hard for them to get here. Many of these people were the forgotten men and women, many of them. And they loved what I had to say. PRESIDENT DONALD TRUMP: But more importantly, they’re gonna love the result. PRESIDENT DONALD TRUMP: I spoke to– President Bush yesterday. And– ’cause I didn’t get to see him much here. This was a little– a little bit hectic. But I spoke to him yesterday. Terrific person. We had a great talk. But this was so beautiful. And having The Mormon Tabernacle Choir and everybody else that participated, it– it was special. But you look at that tremendous area of wall to wall people. And I didn’t hear a negative remark as– as many– nobody knows how many people it was. I didn’t hear a negative comment or remark. There was no shouting. There was no anything. It was really– I call it– it’s a sea of love. It was really a special day.